It's been a while since I have seen Michelle Dockery on the carpet but she returned for the 70th Primetime Emmy Awards at the Microsoft Theater in LA. 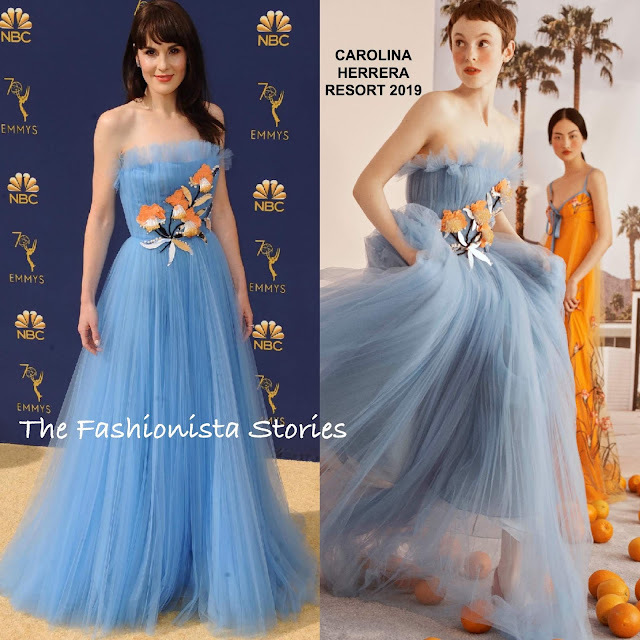 This is why I miss Michelle as she looked divine wearing a CAROLINA HERRERA RESORT 2019 strapless sky blue layered tulle gown featuring ruched tulle, floral embellished bodice. I think without that detailed bodice, Michelle's gown wouldn't have had much of an impact. The color contrast of the beaded florals gives it life. Straight tresses with bangs and HARRY WINSTON jewelry finished up her look.